TORY RICHARDS: Torture or Entertainment? I invested in a 62 inch cat tree for my babies and placed it in front of the window. Directly outside the window I placed a bird feeder. This morning it looked like a picture straight out of Snow White. Squirrels, doves, cardinals, chickadees (if the hawk shows up I'll worry) and a bunny were partaking in the seeds. The cats, of course, were excited and riveted to the scene. It was like they were at the movies. Tails wagging, little sounds, okay growls, emitting from them. Now they're all perched upon various spots on the tree just watching. And I found myself thinking, is this entertainment to them, or am I teasing them? Then I figured, they need something to do. They're inside cats. Besides, I know I'm entertained! 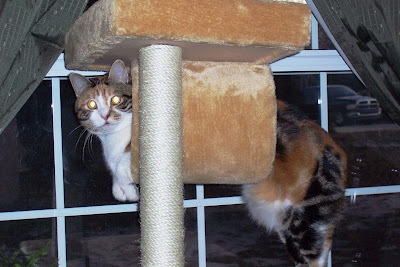 LOL Here's a picture of Gin Gin, my almost 20 pound calico, trying to squeeze herself into the tube at the top of the tree. I know the tube looks small, but honestly, Jezzie fits into it comfortably. Course...she only weighs about 8 pounds. I'll have to send this photo to my cat loving sisters. The one sister has two cats and a tree...the other has been babysitting fat Charlotte for months until one of her son's can get his family settled into a larger home but she had her own kitty for about 19 years. Gin Gin is sooo beautiful!!! Nineteen years! I can't imagine having a beloved pet that long. I know cats live a long time but worry over what will happen to my little felines should I go first. I've made my wishes known to my family though.